Must. Work. Through. Pain. To. Finish. The. Chicken. Nugget. Page. okay, that was freaking hilarious. hope the pain isn’t too bad, and remember to take breaks when you need them, okay? We’ve all been there. Meat tastes better reconstituted anyway. Just don’t injure yourself too much more by working through the pain. We’re (at least most of us) willing to wait for the next page a bit longer if it means that we’re more likely to see you tell the story you want. Well, that wasn’t random at all. Mina’s got fire Unless that’s the demon demanding nuggets. Oh, Mina. … I’ve been there. Some Guy and That Other Guy had better super-size it. Speaking for myself, my support does not in any way obligate you to work while in pain. 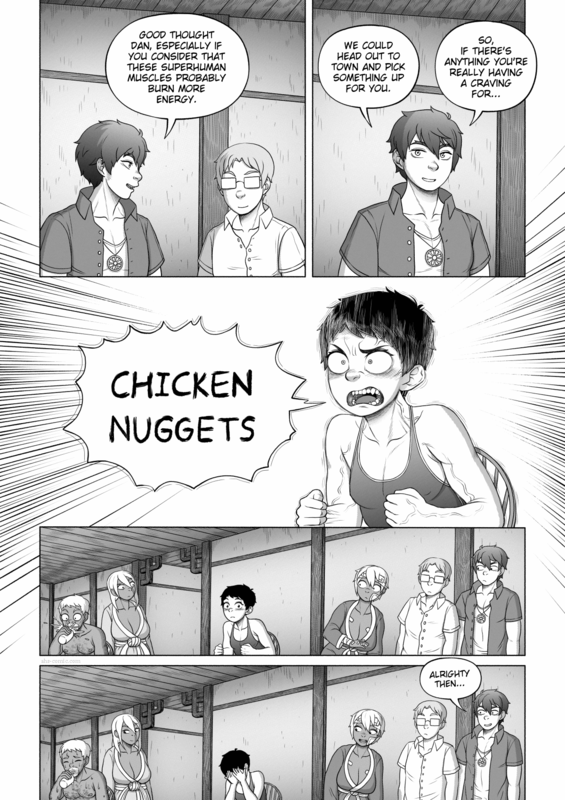 Though it’s true the Chicken Nugget Page might. Seconding everything that’s been said about working through the pain. Please pace yourself. OMG FUNNIEST PAGE EVER! and i can’t believe i’m actually still saying omg. NO MORE DRAWING UNTIL THE PAIN STOPS!!!!! Now we know the name of The Mouse That Roared! OK, so on the one hand, really fantastic page. On the other: pain. Uhm, so, yeah, I’ve been there, done that, and got pretty much the same response from everybody around me :). Everyone knows human tastes like chicken. But yeah, echo the comments about aggravating injury, pain not good, unless part of proper physiotherapy. Please don’t torture the artist! Get that girl some dank nugs! Hey! I just noticed that Some Other Guy has a name! I’m a little slow on the uptake, I guess. I concur with the consensus expressed above. I admire your drawing skill, and enjoy your story. I hope you will be able to continue, but I wouldn’t want that at the expense of your health. I think page 80 might be where we first learn Some Other Guy’s name. Anyone feel free to correct me if I’m wrong. Oh man. I got a good laugh out of this one. Who would have thought demon possession was so funny. They better get her at least two of those 20 chicken nugget packs. Things could get ugly very fast if her craving isn’t sated. And large fries too, just to be safe. Glad to see the comic is continuing. Always gives me a laugh. Just remember not to push yourself too hard. Your health is more important. PS Also – the faces! THE FACES! Ha! Fortunately for Mina, they’re in Japan. No, that’s where they are from. They are “currently” in a fictional possibly South American country … I think. I should probably comment on this haha. Mina and Erin are from Prussia, basically Germany but bigger. Amaria, where Erin is originally from, is a huge island in south east Asia and the people living there have a genetic mutation that gives them their light hair, blue eyes and brown skin, among other things. Thank you. Backstory is good. You have fought well, Worth it. And rest well brave art soldier.